Need a different way to get your logo to your target market? Birdieball is a limited flight golf ball that looks just like a napkin ring. Birdieball flies, feels, and reacts just like a golf ball, but it only goes 40 yards! Named 2005 PGA Best New Product, it’s the most innovated product to hit the golf market in 100 years! With your logo in full color, you can create buzz about your business and bring golfers to your business. Works great for tournaments, tradeshows or special events. With a 1″ x 5″ imprint area, your message can be in the hands of your target market for your next tradeshow or event. 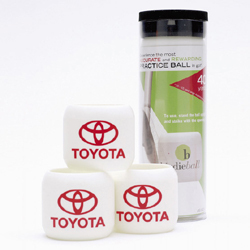 Can be packaged single BirdieBall with business card, in 3 or 6 packs, or loose, you name it, we can customize it for you.